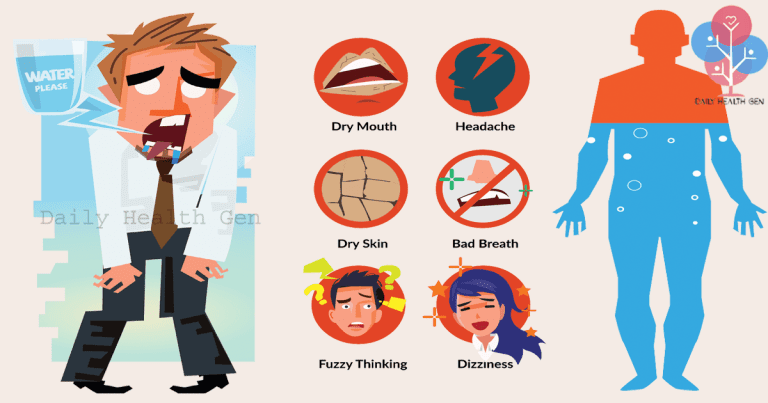 Health 10 WARNING SIGNS THAT YOUR BODY IS DEHYDRATED! When it comes to the content of the human body water take 2/3 of our body weight. Water is essential for life, without water the organism will endure not more than few days. Looking at the content of the organism water is important for every part of the body, every cell, tissue depends on water. Water is important for the organism because it maintaining the body fluids regulates the body temperature, lubricates the eyes and joints, protects the tissues, spinal cord and joints, removes toxins, improves digestion, controls calorie intake and maintaining the skin health. Hydration is essential because when the body lacks water does not function properly. You can improve your hydration level by consuming water and foods rich in water. In the situations when the body losses weight for example during workout, diarrhea, vomiting, frequent urination, diabetes or excessive sweating leads to imbalance of the electrolytes in the body which lead to dehydration and impeded bodily functions. Lack of water in the body can affect on the fluid that surround the brain and protects from mild bumps and movement. Dehydrated body has not enough blood flow to the brain so the supply with oxygen is reduced. Recent study which was published in the Handbook of Clinical Neurology states that one of the possible reasons for migraines and tension-type headaches can be insufficient water in the body. So, the next time you’re about to reach for a painkiller, you should drink a glass of water instead. If the cause for headache was dehydration, the headache will soon go away. Growth of bacteria in the mouth can be caused when the mouth is dry and the body cannot produce enough saliva. This leads to mouth dryness and bad breath. Water is responsible for lubrication of the digestive system and participates in the part of cleansing. With proper water amount the bowel movements are regular and constipation is never happening. But when the body has lack of water, the stool became hard which leads to constipation. Also lack of water activates heartburn and indigestion. Lack of water in the brain can have a negative influence on your decision making, mood, and memory. Moreover, dehydration can lead to forgetfulness and trouble focusing, thinking, and communicating-known symptoms of brain fog. A 2013 study published in Clinical Autonomic Research, dehydration, along with fatigue, lack of sleep, and prolonged standing, is one of the most frequent triggers of brain fog. Normal state of going to the bathroom is with pauses of few hours. When you are not going in the bathroom on every few hours it is a sign that your body lacks water. Normal urination supposed to happen 4 to 7 time per day anything less than that points out the your body lacks water. Urination is the natural way of removing toxins from the body . Changed color of the urine means that you are not consuming enough amounts of water, when your urine is in dark color it tells you that your body is dehydrated. You are not always hungry when you are experiencing food carving. Sometimes your body is trying to tell you that needs water. Next time, do not grab right away those snacks, but instead have a glass of water. When the body is dehydrated sends mixed up messages to the brain, instead of thirsty the brain recognizes as carvings for food. Study form 2014 showed that dehydration has negative influence on performance. For every 1% change in body weight resulting from dehydration, the heart rated changes in an average of 3 beats per minute. Lack of water can also lead to low blood pressure and fast heart palpitations due to the additional stress on the body. This may cause panic and anxiety. In order the skin to remain in good condition and elastic it need certain amounts of water. Low levels of water can lead to less sweating meaning that the body is not capable to remove the oil and the dirt accumulated in the pores or on the skin. Dry lips are one sign that your body is dehydrated. Lack of water in the body can be the cause of low blood pressure and diminished oxygen supply in the body, including the brain. Insufficient water amounts in the body are known to lead to sleepiness, fatigue, and lethargy. Also, when a person is dehydrated, the body is additionally stressed and it has to work much harder on ensuring proper blood circulation, transportation of nutrients, and breathing, which results in tiredness. Drink enough water and different liquids every day. Start your day with an extensive glass of water furthermore drink one huge glass before every feast. Set an update on your telephone in the event that you have a tendency to neglect to drink water. Continuously convey a water bottle with you, regardless of where you’re going. Stay away from liquor, caffeinated drinks, and energized refreshments which are known to bring about parchedness. Continuously counsel your doctor in the event that you encounter solid thirst, unsteadiness, not passing pee for over 8 hours, and a quick and feeble heartbeat. On the off chance that you encounter vomiting, loose bowels, and fever, increment the admission of liquids to reduce dehydration.